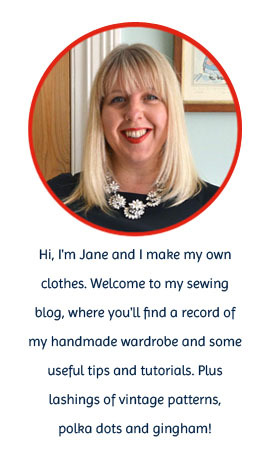 Looks brilliant Jane, love the fabric. Is it ok if I put a pic in my latest sew along post? ps I was reading that post by Gertie on the overlocking stitch too with a light bulb going on in my head!! That's beautiful Jane - excellent job! I've been looking for a skirt pattern just like that - thanks for the tip re the book! Thats a really cute skirt Jane! I love the fabric! This is gorgeous Jane! And once again, you make it all look so easy! So darling! Fits you and your personality like a glove! I adore Japanese pattern books! I have several and have never actually made anything from them. So sad, but they are terribly inspirational. I love the easy going sweet style. I think I might just have to pull one out today and maybe....gasp! use it! looks great and thanks for such a concise review of the book. i'll have to look on amazon for it now! Jane, this is indeed tres chic. Suits you so much! Very nice!! I love the slightly longer length, too. I have been taking a look at your blog. You have so many amazing projects! I really like the print! Lovely! That is such a lovely skirt! Really flattering and the print is gorgeous! It's gorgeous, and the fabric is totally fabulous. Love the stylized roses! Your skirt is absolutely fabulous. Enough to make me reconsider not buying the book because I'd never get round to tracing out the pieces! You say how quickly you managed to sew it up (2hrs), but how long did it take you to trace out the pieces and what is the size range the patterns come in? Thank you Jane. The pics from the book you showed in a previous post are gorgeous and your skirt has come out beautifully (lovely fabric too! ), so it is very tempting. That's so lovely. I adore pleats, and the a-line of the skirt is perfect. Japanese patterns have always looked rather intimidating, but you and Kate make it look do-able. Maybe I'll have to dip my toe in the waters after all! Beautiful fabric and the pattern is simple enough to showcase the fabric. Love it.